Discussion in 'iPhone' started by Leotno, Sep 22, 2012. My phone has a streak of light leaking from in-between the glass panel and the structure; it is right under my lock button. Kinda makes the lock button look illuminated. Anyone else notice a problem like this? Looks like you might need to get it exchanged for another one. It is same with me. I bought it on 22 Saturday, got it replaced today. But still second replaced set has same issue. Let me know if you are able to get the replace and correct handset. I got mine replaced yesterday at the Apple store no problem. The girl there saw the leak immediately and even took it in back to show other employees. Anyway, I had called ahead and they said they have separate stock for replacements. Also said don't bother coming in without a genius appointment and they're not taking stand ins. Got a new phone with new box etc. They would have given me just the phone if I didn't have my old box + accessories to give back to them. They said the refurbs are just for those who didn't buy directly from apple. Calling apple care was a big waste. Waited forever to talk to someone who had no idea about the possibility of a light leak and seemed like he didn't believe me. Had pretty much the same conversation someone else posted in a different thread about them saying to go to the Apple store (an hour away) instead of them mailing me another phone. Finally, after agreeing to send a phone, they wanted $29 plus shipping to send it and credit card info for cross shipping. Forget that. Terrible service. does your new phone have the leak? I noticed this on mine but am not concerned about it. ok my phones has the same leak.to make the thread more helpful please if someone DOES NOT have the leak post here, so people can know it is in fact a defect. upon return to the store, they said they were aware of some sort of light issue, and promptly replaced the device with a brand new one out of the box, sans- accessories. Apple needs to start building their stuff in the USA. What is the problem caused by light leaking? Or is it just a cosmetic issue when you are standing in the dark? YES!!! China quality is pizz poor. Having the same issue. Noticed it last night and read today's thread. I bought this at AT&T so I doubt I'll be able to have it exchanged. Unless I just wait for AT&T to get stock. Then I suppose I would get the black iPhone. Sounds like the white version is affected. Don't know wether I want to deal with a light leak or black edges that get scuffed. Okay then be prepared to pay $1499 for the "Made in USA" iPhone.....The reason most products are made in China is because they can afford to sell the products for much less by paying the factory workers at Foxconn in China, pennies. Trust me, I'd LOOOVE to not see that disgusting "Made in China" badge on products (it really does make me gag a little when I see it) and bring manufacturing back to our continent but it just doesn't work that way. It is so odd that as soon as I saw this thread, my iphone 5 froze as I was checking for the light. When I say froze I mean the screen was zoomed in on the lock screen and I could not move anything around. Luckily I was manage to shut down the phone and play around to swipe to turn off. By the way I have the same light issue as well but just a tiny speck. Hopefully Apple can swap it out. I also noticed the indent or discoloration on the right side to the screen about an inch down. I also realized just today that my iphone box is a tad bit damaged on the corner. Not sure if it was Verizon's handling or Apple. Hate to break it to you, but those workers in China MIGHT make $9 or $10 a MONTH. As a European, I have absolutely no desire to see a massive price increase for a device designed and manufactured nowhere near me. Yeah, that looks pretty bad. You won't have a problem getting it replaced though. That is one plus of working with apple. They my have some lemons, but thy don't make it hard to get a new one. No light leak on my white iPhone 5. It disgusts you? Wow. Why not just not buy one - or any electronics for that matter since most of them are made in Asia? Worker pay is just a small part of why things are made in the east. The entire supply chain, including raw materials is found there, and that's why it makes sense to make electronics over there. I have the same exact issue realized last night. I was like..."is it some kind of feature? Notifying me the screen is powered on?" LOL. My GS3 that will go to Craigslist has LED notification that will tell me lots of things so it was my wishful thinking.. Anyway made an Genious bar appointment this afternoon. This is not good Apple! "The light leak and loosening chamfer on BGR’s defective iPhone 5 was a 64GB white and silver model running on AT&T. 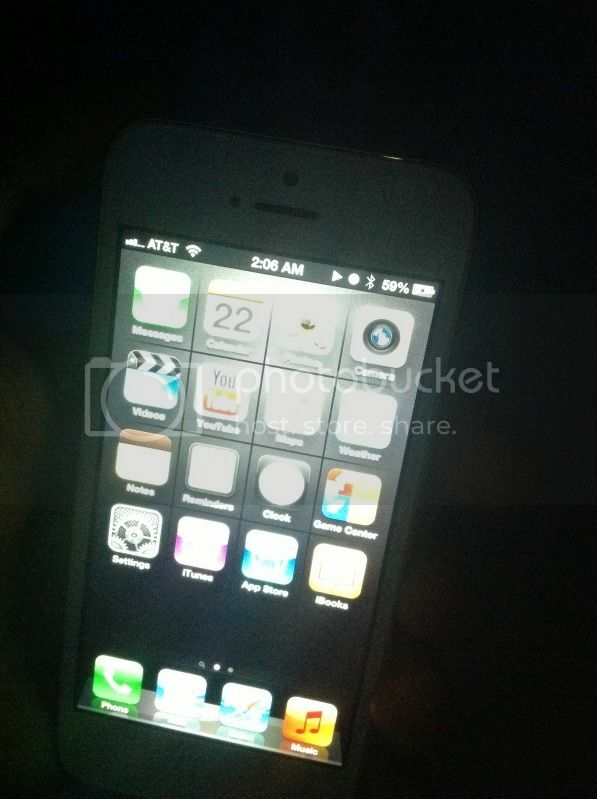 The light leak is unnoticeable except when the iPhone 5 is used under low-light or completely dark situations. Various members on the MacRumors forums have reported the same problem, with some receiving brand new (not refurbished) models as replacements from Apple Stores. One member who goes by the handle “vineetnangia” said the replacement Apple provided still had the same issue."